Simply select the item you’d like to purchase and click “Add to Shopping Bag”. Click “Checkout now” and a page will appear so you can insert your billing and shipping details. Follow the checkout instructions provided and select your preferred payment method. Once you’ve reviewed and confirmed your order, and have accepted the terms and conditions, your order is placed and you’ll receive a confirmation email. 2) Which payment methods are accepted? We accept payment via Visa, MasterCard, American Express, PayPal or Sofort Banking wire transfers. Standard bank transfers and payment on delivery (COD) are not accepted. For complete Payment and Security details, please clickhere. 3) My payment has been declined. What should I do? Kindly double-check that the details you’ve submitted are correct. For credit card payments, make sure that the expiration date, billing address, and 3-digit code on the back of your card have been entered correctly. It’s possible that the payment was blocked by your bank. Please contact them for further details. If the problem still persists, you could try an alternative payment method or contact our Customer Service at customerservice@nomination.com. Once you’ve received the order confirmation email, it is not possible to make updates online. Please send your request to customerservice@nomination.com as soon as possible, and our Customer Service Team will determine what actions may be taken, depending on what stage the order has reached. 5) Can I modify the delivery address after placing my order? Once you’ve received the order confirmation email, it is not possible to make updates online. Please send your request to customerservice@nomination.com as soon as possible, and our Customer Service Team will determine what actions may be taken, depending on what stage the order has reached. For payments made via PayPal, for security reasons, Nomination reserves the right to deliver only to the address associated with the PayPal account. 6) How do I use my Promo Code? Promotions, or Promo Codes, provide you with discounts on your online purchases. To receive your discount, insert the Promo Code in the appropriate field during checkout. You will immediately see the discount applied to your total order. Only one Promo Code can be used per order. Some restrictions may apply regarding the validity period, product category, and/or purchase order minimums. Any and all restrictions will be stated in the promotion. Promos which reduce an item’s price can’t be used on products which have already been discounted. To receive Promo Codes, subscribe to our Newsletter. 7) How long will it take to receive my order? The delivery timeframe is specified in each item’s Product Details. The estimated period is based on the expected production timeframe, and depends on product type and stock availability. In some cases, your item may be specially made just for you, and the timeframe depends on the artisanal production process required by our Florentine workshops. Nomination will make every effort to respect the stated delivery timeframe. We will always inform you if issues arise during particular holiday periods, or if there are unexpected production delays. You will see a notification in your Shopping Bag, or you’ll receive an email from our Customer Service Team. 8) How do I view my order and check its status? If you have made the purchase from a registered account, go to “My Account” and click on “My Orders”, where you’ll see a history of all the orders you’ve made. You’ll be able to check on the status of each order. We will send a delivery notification 24-48 hours prior to delivery to the email address you provided during checkout. If you made your purchase as a guest user, or without having logged in to your account, please check the automatic emails that you will receive to the email address indicated in the order. 9) What kind of packaging does my Nomination jewellery come in? All Nomination jewellery comes in our signature Nomination packaging, which also contains our warranty. You can add a gift bow during checkout. Individual Composable bracelet Links are shipped as a maximum of 3 Links per box, unless otherwise requested during checkout. Product-specific packaging is provided, taking into account each product’s characteristics and shipping requirements. You can view the packaging in each item’s Product Details. Shopping bags are provided upon request during checkout. 10) Can I request additional gift boxes or greeting cards? If you’ve purchased gift items you’re giving to more than one person, it’s possible to add additional gift boxes during checkout. When you check (✓) Greeting Card, you’ll also receive a Nomination Greeting Card where you can write your best wishes. 11) I received a Gift Card. How can I use it? By shopping online! Your Nomination Gift Card can only be used to make purchases at our official online shop www.nomination.com. It can be used towards any of our online products. Insert your unique Gift Card Promo Code in the appropriate field during checkout in order to receive your discount for the exact value specified in your Gift Card. The card can only be used towards one order and the entire value of the card must be used. For complete details related to Gift Card Terms and Conditions, see Gift Card. The Nomination online shop delivers to Andorra, Australia, Austria, Belgium, Brazil, Canada, China, Colombia, Cyprus, Czech Republic, Denmark, Ecuador, Estonia, Finland, France, Germany, Gibraltar, Greece, Hungary, Iceland, Ireland, Italy, Latvia, Lithuania, Luxembourg, Malta, Mexico, New Zealand, Norway, Poland, Portugal, Republic of San Marino, Romania, Slovakia, Slovenia, Spain, Sweden, Switzerland, The Netherlands, United Kingdom, United States, Uruguay, and Venezuela. Nomination will send you a confirmation email once your order has been shipped. You will also receive an email directly from the courier service, either UPS or DHL, containing the Tracking Number, which you can use directly on their website to track your shipment. You’ll also receive automatic update emails. If problems arise with the delivery, you’ll receive email notifications from our Customer Service Team. 3) How does your delivery service work? Orders are shipped via UPS or DHL and in general, the courier service makes up to 3 delivery attempts over a period of 3 consecutive business days. If no one is present at the time of delivery, an Attempt Notification is left. If all 3 delivery attempts are unsuccessful (or if the address provided is incomplete or incorrect), the package will be held at a nearby courier facility for 5 days, pending further instruction. 4) Will someone need to sign for the package? In general, a signature is required at the time of delivery. In the case of UPS deliveries to private/residential addresses, the driver is authorised to leave the package with a neighbour (Indirect Delivery). If your order is being left in a secure location, UPS may deliver without requiring a signature. The driver will leave you an InfoNotice stating where the package was delivered. It’s at UPS’ discretion to determine what constitutes as a secure location. In Europe, this option is only available for Austria, Belgium, Czech Republic, Denmark, Finland, France, Germany, Ireland, Italy, Luxembourg, Norway, Portugal, Spain, Sweden, The Netherlands, and United Kingdom, and is limited to Letter Box Release (LBR), which is allowed when packages are small enough to fit entirely into a letterbox without being damaged. This option is not available for packages containing declared high-value items and/or high-risk material, nor is it available for orders shipped as per the Signature Required or Adult Signature Required options. 5) Can I have my order delivered to a PO Box? For security reasons, we don’t deliver to PO Boxes or similar. An address is required where someone can sign for the package. If an order is shipped to a PO Box, our Customer Service Team reserves the right to request an alternative address, or to reimburse the order if a valid address is not provided. 6) My order is being held at a UPS Pick Up Point (Access Point). How do I receive my order? Packages are held at UPS Access Points when there’s no one present at the time of delivery and it’s not possible to leave the package with a neighbour. Currently, this procedure is active in: Belgium, France, Germany, Italy, Poland, Spain, The Netherlands, United Kingdom. Not all types of deliveries can be left at Access Points. Deliveries must respect the UPS-established conditions, and it’s at the driver’s discretion. If your order is being held at an Access Point, insert your Tracking Number on the UPS website www.ups.com to find details regarding the location, address, and business hours. Your package will be held at the Access Point for 10 days, and if not picked up, it will be returned to sender. 1) How can I create my very own personalised Composable bracelet? Have fun creating your personalised bracelet in “Create Your Bracelet”! Choose the base colour, the right length for your wrist size, and the height you want. Then choose from among the hundreds of Links available, using the filters and “Search” field to help you look. Click on the Link you want, and drag and drop it to exactly where you want the charm to be on your bracelet. 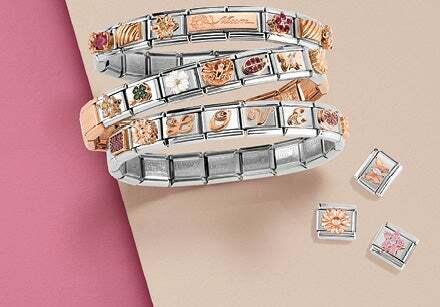 Add your Links one by one until you’ve created your perfect, one-of-a-kind bracelet. Add it to your Wish List or Shopping Bag and click “Checkout” to buy it straight away. 2) Can I buy individual Links and add them to a Composable bracelet which I already have? Of course, that’s the whole idea behind Composable: add charms one by one to remember special moments as they happen and make your bracelet change with you, so it’s always as you unique as you are. To buy individual Links, check out “Composable – Links & Charms”. Use the filters to help find the right size Links for your existing bracelet (Big or Classic) and choose the themes you want. Have fun with the over 2,000 Links available! 3) What’s the difference between Composable’s Classic Links and Big Links? Before getting more Links for yourself or for someone close to you, double-check you’ve got the right Link size. 4) What’s the difference between the Cubiamo Collection’s Classic Cubes and Big Cubes? Nomination’s Cubiamo bracelet is available online in two different widths. Cubiamo Cube Charms come in two different sizes. The Product Details for each Cube Charm specify which Cubiamo bracelets they’re compatible with. Before getting more Cube Charms for yourself or for someone close to you, double-check you’ve got the right size. 5) Can I get an engraved Composable Link? Some of Nomination’s Links can be engraved, and this feature is noted in their Product Details. Link engraving takes roughly 20 days and you can find pricing details in your Shopping Bag. 6) Can I design my own Composable Link? Due to production limitations, it’s not possible to create a personalised Link. Each Link is hand-made by our Florentine artisans, and the minimum order is 200 pieces per design. But we would love to hear your ideas for new symbols. 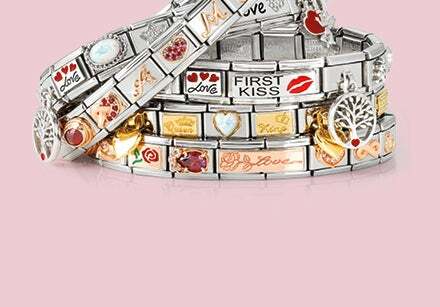 Send us your charm suggestions at customerservice@nomination.com and we’ll pass them along to our Design Department. Our team will also propose similar existing Links and indicate Links you may like which can be engraved. 7) Do any Composable Links have a coloured base? All Composable bracelet Links containing letters or charms have a stainless steel base (grey). For production reasons, it’s not possible to create them on a coloured base. But you can alternate coloured Links with Links containing letters and charms. Create your own look, or get inspired by ours at “Composable - Bracelets”.”. 8) How do I add and remove Links from my Composable bracelet? Adding, removing, and changing around your Links is super easy! It may take one or two tries the first time, but once you get the hang of it, it’s easy-peasy. Watch our how-to tutorial, and see just how simple it is to personalise your Composable bracelet. 1) Can I return or exchange an item that I bought online? If you’re not satisfied with your online purchase for any reason, you can return the item within 30 business days of the date of delivery. For complete details about our return policy, see “Returns”. Once we’ve received the returned item and confirmed all conditions have been met, we’ll exchange the item or proceed with your refund as per your request. 2) Can I return an item that I bought online to a Nomination store or authorised retailer? No, it is not possible to return an item bought online to a Nomination store or authorised retailer. Please follow the return procedure as described above. 3) I received a defective/incorrect item, or an item is missing. What should I do? Please immediately contact our Customer Service Team at customerservice@nomination.com and send us a picture of your order. All orders are hand-packed by our staff, so human error is possible. We photograph the orders during packaging, so our Customer Service Team will compare photos and be able to immediately verify the error and proceed to rectify the problem. 1) Does my Nomination jewellery have a guarantee? All Nomination jewellery comes with an internationally recognised 2-year guarantee that covers manufacturing defects. The guarantee is date stamped and placed together with the item inside our signature packaging. In order to take advantage of the guarantee, you must present both the receipt showing the date of purchase and the guarantee certificate, which has been date stamped and signed by Nomination. Please retain your receipt/invoice or pass it on to the gift recipient. The manufacturer’s guarantee does not cover rhodium-plated and gold-plated items, nor does it cover accidental gemstone breakage. Loss of colour due to improper use is not considered a manufacturing defect. Damage resulting from normal wear and tear, misuse, or oxidation is not covered by the warranty. 2) An item I purchased online is now damaged. Can it be repaired? If jewellery purchased online is damaged during the 2-year guarantee period and meets the guarantee conditions, Nomination will replace the item. Please review Nomination’s guarantee policy and contact our Customer Service Team at customerservice@nomination.com for instructions. 3) The damaged item was purchased at an authorised retail store. Can it be repaired? Please visit one of our official retail stores and they will take care of the repair or replacement as per our policy. Please bring the damaged item along with your receipt and the warranty certificate, which can be found inside the original packaging. Find the authorised retailer closest to you with Store Locator. 4) How can I care for my Nomination jewellery? To maintain the appearance of your Nomination jewellery, follow the care and cleaning instructions provided at Guarantee and Care Instructions. We strongly suggest you refrain from wearing your jewellery when taking a shower or bath or when playing sports. Always remove your jewellery when applying perfume, body lotions, suntan lotions, and ointments. Do not wear your jewellery while using detergents, bleach, ammonia, or rubbing alcohol. Use a soft, dry cloth to clean gold and silver. Don’t use any type of brush or abrasive material which could scratch your jewellery. Use lukewarm water and soap and a brush with soft bristles to clean your Composable bracelet’s stainless steel. 1) I’m having technical difficulties using the website. Who should I contact? It may just be a temporary issue, or it could be related to your Internet connection. Make sure your Internet is working, and try again after a few minutes. If the problem persists, email us at customerservice@nomination.com. 2) I have additional questions. How can I contact you? The Nomination Customer Service Team is always eager to help. Email us at customerservice@nomination.com and you’ll receive a reply within 24 hours. Please contact the store directly. Find the authorised retailer closest to you with our Store Locator.